Broadway has been added to your itinerary. Escape the urban bustle at Bronx Zoo and East River Waterfront Esplanade. Shop till you drop at Fifth Avenue and Shopping Girlfriend NYC. There's much more to do: go for a walk through Central Park, race across the water with a speed boat tour, enjoy breathtaking views from Empire State Building, and pause for some photo ops at Statue of Liberty National Monument. For where to stay, more things to do, maps, and more tourist information, read our New York City online attractions planner . Jeddah, Saudi Arabia to New York City is an approximately 17.5-hour flight. You can also do a combination of flight and bus. You'll gain 8 hours traveling from Jeddah to New York City due to the time zone difference. In June, New York City is a bit cooler than Jeddah - with highs of 31°C and lows of 21°C. Wrap up your sightseeing by early afternoon on the 7th (Fri) to allow enough time to travel to Niagara Falls. Start off your visit on the 8th (Sat): admire the sheer force of Niagara Falls, then Head underground at Cave of the Winds, and then get some fabulous bargains at Fashion Outlets of Niagara Falls, USA. On the next day, admire the landmark architecture of Frank Lloyd Wright's Darwin D. Martin House Complex, then shop like a local with Walden Galleria Mall, then pause for some serene contemplation at St. Mary of the Cataract R. C. Parish, and finally admire the sheer force of Bridal Veil Falls. For where to stay, reviews, other places to visit, and more tourist information, read Niagara Falls day trip planning site . Traveling by combination of flight and bus from New York City to Niagara Falls takes 5.5 hours. Alternatively, you can do a combination of bus and flight; or drive. Plan for little chillier nights when traveling from New York City in June since evenings lows in Niagara Falls dip to 17°C. Finish your sightseeing early on the 10th (Mon) to allow enough time to drive to Cleveland. Kick off your visit on the 10th (Mon): try your luck at JACK Cleveland Casino, then contemplate the long history of West Side Market, and then see the interesting displays at Rock & Roll Hall of Fame. Here are some ideas for day two: identify plant and animal life at Nature Center at Shaker Lakes and then admire the masterpieces at The Cleveland Museum of Art. For maps, ratings, and tourist information, you can read our Cleveland trip itinerary planner. Traveling by car from Niagara Falls to Cleveland takes 4 hours. Alternatively, you can take a bus; or take a train. Traveling from Niagara Falls in June, Cleveland is a bit warmer at night with lows of 20°C. Finish your sightseeing early on the 11th (Tue) to allow enough time to drive to Lansing. Lansing is the capital of the US state of Michigan. Start off your visit on the 12th (Wed): don't miss a visit to 9-11-2001 Remembrance Memorial, admire nature's wide array of creatures at Potter Park Zoo, then trek along Pere Marquette Rail Trail, and finally get a sense of history and politics at Michigan State Capitol. Get ready for a full day of sightseeing on the next day: meet the residents at Boulder Ridge Wild Animal Park and then stop by Horrocks Farm Market. For other places to visit, where to stay, traveler tips, and more tourist information, use the Lansing road trip tool . Getting from Cleveland to Lansing by car takes about 4 hours. Other options: fly; or do a combination of flight and bus. Plan for a bit cooler nights when traveling from Cleveland in June since evenings lows in Lansing dip to 17°C. Finish up your sightseeing early on the 13th (Thu) so you can travel to San Francisco. Get a sense of the local culture at Alcatraz Island and Union Square. For shopping fun, head to Ferry Building Marketplace or Ferry Plaza Farmers Market. There's still lots to do: snap pictures at Golden Gate Bridge, steep yourself in history at City Lights Booksellers, take in the waterfront at Fisherman's Wharf, and examine the collection at Exploratorium. For reviews, ratings, where to stay, and more tourist information, use the San Francisco tour itinerary planning tool . Getting from Lansing to San Francisco by flight takes about 9 hours. Other options: do a combination of bus and flight; or drive. The time zone changes from Eastern Standard Time to Pacific Standard Time, which is usually a -3 hour difference. Traveling from Lansing in June, you will find days in San Francisco are little chillier (25°C), and nights are about the same (15°C). Wrap up your sightseeing on the 16th (Sun) to allow time to drive to Yosemite National Park. On the 17th (Mon), get great views at Tunnel View and then stroll through Mariposa Grove of Giant Sequoias. 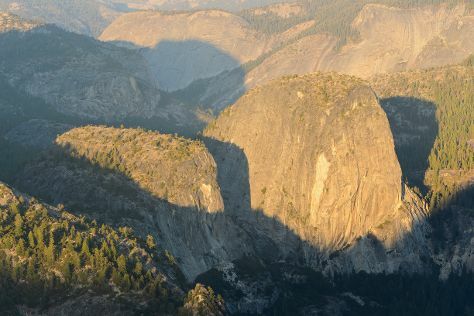 Keep things going the next day: make a trip to Olmsted Point, then explore the striking landscape at Glacier Point, and then trek along Panorama Trail. To find photos, traveler tips, and tourist information, go to the Yosemite National Park trip planner . You can drive from San Francisco to Yosemite National Park in 4 hours. Alternatively, you can do a combination of flight and car; or do a combination of flight and bus. Expect a bit warmer weather when traveling from San Francisco in June: highs in Yosemite National Park hover around 30°C, while lows dip to 7°C. Wrap up your sightseeing on the 18th (Tue) to allow time to travel to Los Angeles. Start off your visit on the 19th (Wed): stroll through Venice Beach and Boardwalk, then take a stroll through Abbot Kinney Boulevard, then see the interesting displays at The Getty Center, and finally don't miss a visit to Hollywood Walk of Fame. Get ready for a full day of sightseeing on the next day: take a leisurely stroll along Santa Monica Pier, wander the streets of Montana Avenue, then shop like a local with Third Street Promenade, then buy something for everyone on your list at The Grove, and finally stop by Amoeba Music. To find other places to visit, traveler tips, ratings, and more tourist information, you can read our Los Angeles trip itinerary builder . Getting from Yosemite National Park to Los Angeles by combination of car and flight takes about 4.5 hours. Other options: drive; or do a combination of bus and flight. Traveling from Yosemite National Park in June, expect somewhat warmer with lows of 19°C in Los Angeles. Finish up your sightseeing early on the 21st (Fri) so you can travel back home.